Allow me to explain what you’re seeing. This is a picture of the cupboards beneath our kitchen sink. Typically, you’d see household cleaners, a fire extinguisher, a box of trash bags… Not here. Well, not any more. Last week, we embarked on the change. Zozo is officially a pup-of-a-certain-age, and our vet let us know the time had come to switch him from Adult Dog Food to a Mature This will help us keep him strong and healthy as he approaches his golden years. This also freaked me out a little bit, because I have expectations that Doodle will be around for at least another 6 years. But I promise not to get too macabre today. Both MJ and Zozo eat Iams ProActive Health Large Breed dog food. Zo made the switch to Iams when we bought our house (remember this?) and MJ has never known anything else. From puppies to adults, this has been our kibble of choice. I like the Iams because it has lots of protein and not a lot of grain filler. Sometimes we throw carrots or green beans on top of their bowls to be fancy. We buy massive bags of food and fill a tupperware in the kitchen. One tupperware would take up half of the undersink area. Now there are two. They are labeled. MJ’s sticking with the Iams ProActive Health Large Breed, and Zo is transitioning to Iams ProActive Health Mature Large Breed. They try to hide the word, but it’s there. Our baby is getting old. In the picture above, Zozo’s Mature food is on the left. 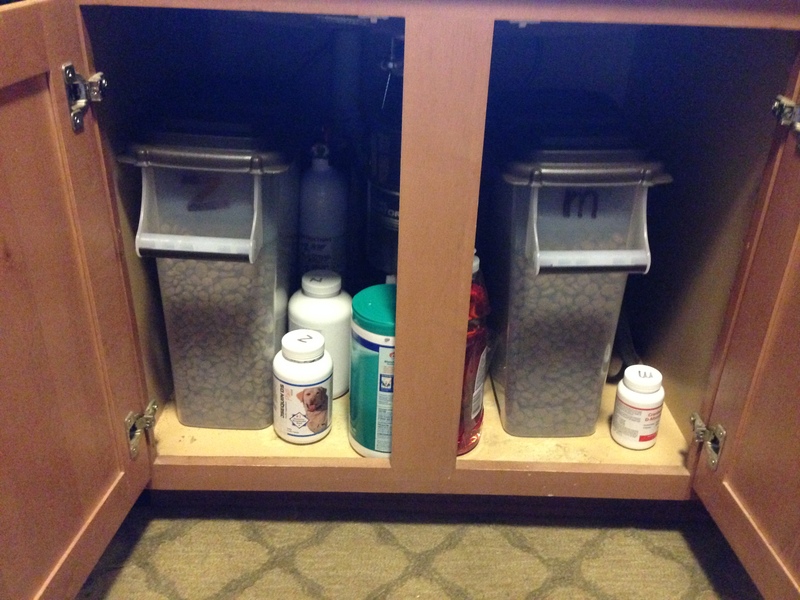 The two white bottles are his supplements: a fish oil, which he takes for his skin allergies, and a joint supplement. MJ’s Adult food is on the right, and the white bottle is her cranberry pill supplement because she has some UTI issues. Zo loves his new food. MJ loves nabbing a stray kibble bit from his bowl. And scooping and replacing two food bins is really helping reinforce our sit/stays. Multiple tupperware can also make for a confusing, half-asleep breakfast time. Hence the labels. But that’s my issue. This entry was posted in 2014 and tagged Adult Dogs, Iams ProActive Health Large Breed dog food, Iams ProActive Health Mature Large Breed dog food, Mature Dogs, MJ, pet health, rescue dogs, Zozo by klgf. Bookmark the permalink. hay ewe dawgs…sounds like mom haza grate plan…N why settle for fish oil when ya can haz…..de… hole…. fish…flounder, trout, toona, mackerull, perch, sea bass, bloo gill, salmon….